Hasunuma "Numa-chan, Numa-sensei, Fake Hasunuma"
Hasunuma is a teacher from Komaki's school. Since the start he shows to have a weird behaviour and to be aware of many secrets. With students he appears as a good teacher, the one that jokes with them and that "closes an eye" whenever see one of them doing some little forbidden things in school, due to this reason seems to be appreciated and loved by them. He joins the story as supportive character but he later becomes one of the main as well, since his part in the plot will grow of importance. While things become dangerous he's always the one in the dark to be ready to fix them, at least with our main characters involved with. Hasunuma appears to be mysterious and smart, and soon punish Aoki-sensei when he abused of Kurokawa, by making him litterally "disappear". It is revelaed that he has abilities like our main charas have, the curious thing is that he seems to have all of the 5 senses as very highly improved. He's shown to have a particoular attention on Ikeno, Kurokawa, Tsurumi and Shijou. 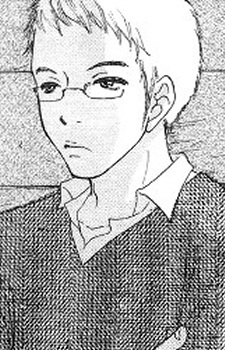 Later he purposes Kurokawa to be the mother of his child. Hasunuma states that likes Kurokawa Rika, but he himself admit that has another person which he truly deeply love. In the 8th volume Hasunuma finally reveals many of the secrets he holded 'til now. As Tsurumi guessed he has something to do with the "Alien" things. But unlike Tsurumi thought, Hasunuma doesnt "have" an alien inside him, he rather is the alien. So far the aliens we saw in Para Paru are like "parasites", shown as "little creatures with a human-look-like", which live inside persons and would die outside them. Either awaked or sleeping the aliens are inside humans while being on Earth, humans which accepted them, during a dream (like Komaki) or other circumstances. Hasunuma tells to be an alien which "took control" of the Real Hasunuma-sensei. He states that the real Hasunuma wanted to end his life, and at this point the alien came up asking him to borrowing his own body in order to accomplish what he wants to. So he basicly made a deal with the real Hasunuma, which is "sleeping" in the present day, since 3 years yet. Tsurumi, which never liked the teacher, cuz to him always looked suspect, starts to nickname him "Fake Hasunuma" from this point. Then, the alien tell the guys that he came on Earth in order to find someone, which is revealed to be "the" person he truly love: Hana. The type of genders determinate the social position, the lower is the number and the higher is the position they have. Our Fake Hasunuma is one of the "First" type, which is very rare in their world (and for this reason they are near to extinction), and this makes of him like a "King". Only 7 "First" are alive in their actual 100millions population and due to this rarity of him, he's all the day controlled. The story of him and Hana is that, Hana which is a third type, was been sent in order to take care of him and "she" was the only one which always behaved like thought it was correct, even scolding him if it was needed when doing wrong things. For this reason "Hasunuma" clearly fell in love for Hana and when she was hesiliated to Earth, he left their world (without permission) in order to find her. Due to this he always shown to have more care for Komaki than Rika, threatening Kurokawa to make her disappear like he did with Aoki if she'd ever happen to really do to Ikeno the same abuse she was been throught. In the end he planned to remove the aliens from the guys' heads in order to save them and bring them back home.